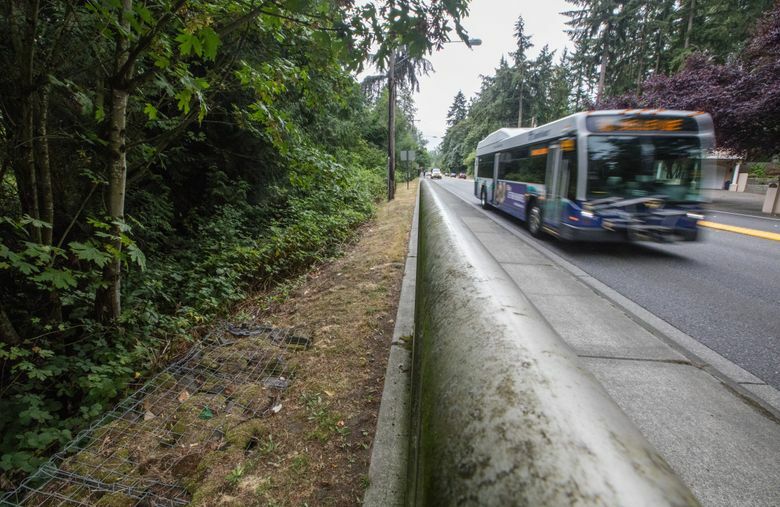 As construction of Sound Transit’s East Link line through Bellevue begins, neighbors worry about the promised protections to Mercer Slough Nature Park and the historic Winters House and whether the city needs stronger protections for the use of parkland. Outside the historic and graceful Winters House on Bellevue Way Southeast, speeding traffic produces a near constant din through much of the day. That’s just a preview of the noise and disruption that will start later this fall as part of Sound Transit’s construction of the $3.7 billion East Link route from Seattle to Mercer Island, Bellevue and Redmond. 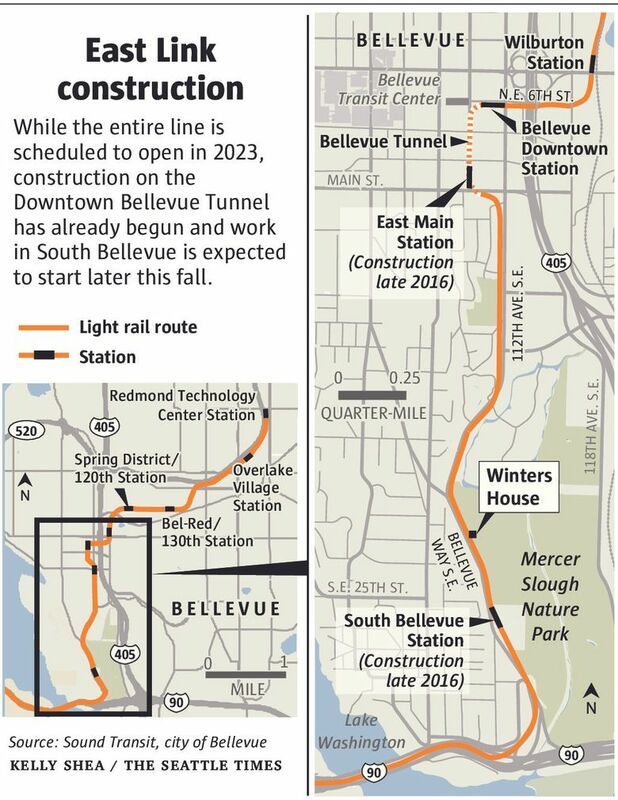 Preliminary work already has begun for the downtown Bellevue light-rail tunnel. In south Bellevue, the light-rail tracks and clearance needed on either side will cut a 50-foot-wide swath through the wooded buffer along Mercer Slough Nature Park, pass about nine feet in front of the Winters House, and replace the current Park and Ride surface lot off Interstate 90 with a gleaming new station and a five-story parking garage. 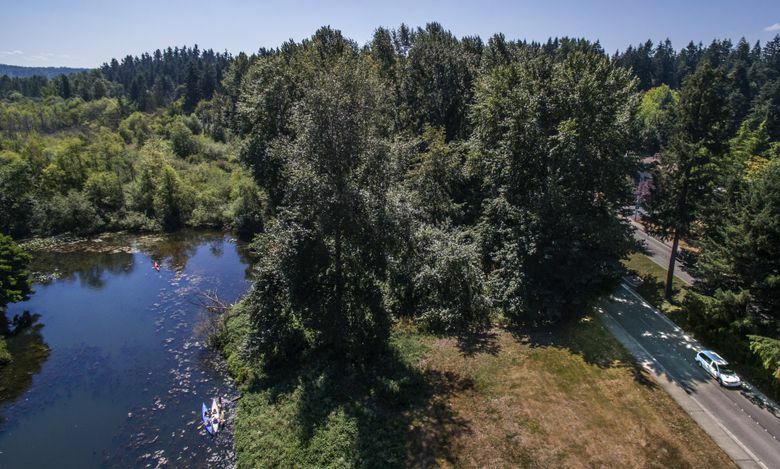 As part of its agreement with the city of Bellevue, Sound Transit promises to restore the wetland buffer by planting more than 2,800 trees to replace the 700 it estimates will be removed. It will monitor the Winters House, the city’s only site on the National Register of Historic Places, and dig a trench so the train passes below ground level in front of it. Sound Transit says it will cover the trench with a lid to muffle the train noise. But neighbors, who have fought the route and filed repeated legal challenges over the potential environmental impacts to the 320-acre park, are renewing their concerns now that construction is just months away. They acknowledge they can’t stop the light-rail route along the west side of the slough but say the city needs stronger protections for its parklands going forward. As part of its negotiations with Sound Transit, Bellevue agreed to permanently transfer two acres of Mercer Slough parkland, some of which was initially purchased with park bond funds in 1988. Residents say Sound Transit will impact many more acres of the park during light-rail construction and close some access points to the Slough’s network of trails. They also say the builders will erect permanent support pylons on park land parallel to Bellevue Way. While the City Council signed off on the agreement last year, neighbors say the public didn’t get to weigh in on the loss of park property. “These parklands that were purchased with taxpayers’ money shouldn’t have been sold without a public process. It’s a violation of the public trust,” said Renay Bennett, a resident of the Bellecrest neighborhood northwest of Mercer Slough. Other cities in the region have faced public backlash over the sale or lease of parkland. In Kent, the City Council had to buy back a 10-acre park it sold to a developer in 2015 when citizens complained that the sale was approved in executive session without public notice and that the property was supposed to remain a park in perpetuity. On Mercer Island, residents were angered over a lease of one acre of a downtown park for a new performing-arts center. They started an initiative petition to require the city to replace any park property sold or leased with land of equal size and value within the same general location. The Mercer Island initiative ultimately failed to collect enough signatures, opponents said, because it severely limited the uses of city parks by prohibiting community centers and swimming pools. The Mercer Island initiative was modeled on a Seattle ordinance approved by voters in 1997, which similarly required that any parkland converted to non-park use be replaced so there was no net loss to residents. In Bellevue, members of the Save The Mercer Slough Committee, which has fought to protect the park over the past 30 years, asked the City Planning Commission this year to consider measures that would prevent conversion of park lands without more public notice. The Planning Commission unanimously recommended that the protections receive further study, but the City Council in July turned down the proposals. Deputy Mayor John Chelminiak said he thought it was an effort to re-litigate the route along Mercer Slough. Other council members said they wanted to retain the city’s flexibility to negotiate park sales when those were time-sensitive and in the public interest. Both city and Sound Transit officials say the East Link project will actually add parkland to Mercer Slough. As part of the negotiations, the city purchased an additional six acres of privately owned land within the park that will connect the Environmental Education Center on the east side of the wetlands to the west side, just south of the Winters House. Sound Transit also paid the city $2.3 million to rebuild a barn for seasonal-produce sales, public restrooms and a wheelchair accessible trail. Sound Transit will deed to the city an additional 1.6 acres behind the new station and parking garage that adjoins the wetlands. And the agency will restore about six acres of unused blueberry fields in the park to wetlands, said Bellevue Senior Planner Camron Parker. He agreed that Bellevue Way will be visually transformed with the construction of an elevated light-rail line, a large station and parking garage. The Winters House and the U-pick blueberry stand will be closed during the estimated four years of construction. Sound Transit said its construction plans include extensive protections of Mercer Slough to prevent silt and pollutants from migrating into the wetlands. Additionally, officials note, the plans meet dozens of local, state and federal environmental regulations. “We’ve been incredibly diligent about protecting the slough and having as small an impact as possible,” said Sound Transit spokesman Bruce Gray. Neighbors remain skeptical about whether Mercer Slough Nature Park will remain a peaceful refuge through construction and when the trains begin to run up to 20 hours a day. And they’re angry about having no say in the transfer of some of its property. They say they hope the City Council will revisit the issue of selling parkland for non-park uses.